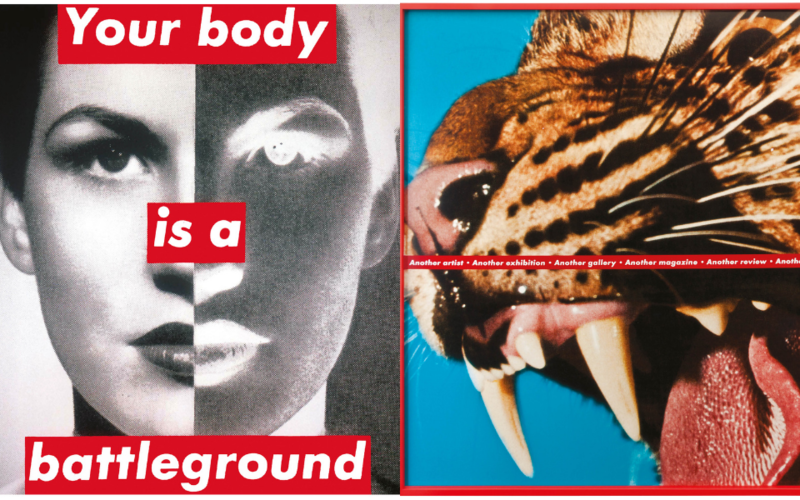 Even if you’ve never been inside a gallery, it is likely you will know Barbara Kruger’s art. Fashionistas adore her for plastering the phrase “It’s all about me I mean you I mean me” over Kim Kardashian’s naked body on a W magazine cover and for allegedly inspiring skate brand Supreme’s famous logo. Politicos either revile or revere her for slapping the word “Loser” over a portrait of Trump on the cover of New York magazine, while feminists admire her as the formidable force behind the “Your body is a battleground” poster, which cropped up across the streets of Manhattan in 1989 ahead of a women’s reproductive rights march. That work caused a stir at the time, but today—in the age of the #MeToo movement—Kruger’s text-based works about power, politics, desire and gender feel positively explosive. Over the past 30 years, Kruger’s biting aphorisms have appeared everywhere—from museums to MetroCards—but this month they are being shown in Hong Kong for only the second time. From March 27, Kruger’s works will be hanging in a pop-up space on the ground floor of H Queen’s as part of a group show mounted by Sprüth Magers gallery. Entitled Eau de Cologne, the exhibition is the latest in a series of ground-breaking all-women shows which German gallerist Monika Sprüth began staging in 1985. Featuring Kruger and others, including Cindy Sherman, Jenny Holzer, Louise Lawler and Marlene Dumas, editions of the shows have been held in Berlin and Los Angeles. Among the works on display at H Queen’s is an arresting image from 1989 showing a naked baby sandwiched between his mother’s legs with a red sign reading “Free love” imprinted above his buttocks. Meanwhile, a new piece, showing a hand holding a bullet, is emblazoned with the words “Believe absurdity, commit atrocity.” In typical Kruger fashion, the work pulls you out of your comfort zone and forces you to reflect on gun violence and the lethal effects of ignorance. Kruger’s upbringing in a working-class family and her experience in the magazine world shaped her democratic visual language. In the 1960s, Kruger dropped out of college and took odd jobs as a telephone operator and a billing clerk. She then landed design jobs at Condé Nast’s Mademoiselle magazine and House & Garden but realised she wanted more. So she travelled, taught and read academic texts by Walter Benjamin and Roland Barthes. “I tried to figure out what it might mean to call myself an artist,” she says. Her first breakthrough came when she began placing searing statements on to images of faces and bodies torn from magazines, books and newspapers. “I used to go to the New York library picture collection, which was a great archive of images. You would see many artists there but also fashion designers,” recalls Kruger, who also rummaged through used bookstores in Los Angeles. She couldn’t afford to make colour prints so she printed photos in black and white, and began creating striking silkscreened images incorporating text, which appeared on T-shirts, billboards and coffee mugs. Toying with idioms and catchphrases, she grabbed people’s attention using irony and wit. She also released 50,000 MetroCards and plastered a school bus and skatepark with statements including “Don’t be a jerk” and “Who owns what?” Some fans of her work speculate this was a jab at the brand Supreme, which controversially used Kruger’s signature text treatment—Futura Bold Oblique text overlaid on a red background—to create their logo. The skatewear brand also released MetroCards in 2017 and is known for its hyped drops of new products. But when asked if her work should be taken as a criticism of the brand, Kruger says no. Kruger has only commented once on Supreme, when she released a brief statement to Complex magazine in 2013 after she discovered Supreme was suing the clothing company Married to the Mob for using its logo. In many ways, Kruger’s reaction to Supreme is what sets her apart. For all her fame, Kruger prefers her work to speak for itself, and deliberately keeps herself out of the limelight.